Roberto San Sebastian’s The Night of the Virgin made waves on the festival circuit in 2016 for its notoriously disgusting subject matter. 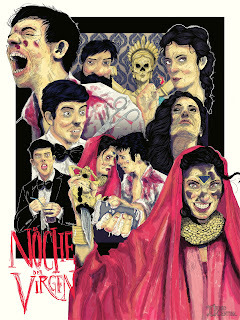 Spanish horror is an interesting genre, and Virgin is no exception. Featuring a hilarious central performance, unexpectedly artistic camerawork, and an outright insane finale, Virgin is hopefully coming to the US soon. Those with weak stomachs and an aversion to every type of bodily fluid will most certainly be repulsed, but die hard connoisseurs of gore will find an absolute gem. Nico is an awkward young man looking to lose his virginity on New Year's Eve. When he agrees to follow Medea back to her house for a one-night stand, he becomes immersed in profane sexual rituals, unspeakable mythologies, and incomprehensible body horror. Guillermo Guerrero's script moves at a snail's pace, slowly ensnaring the viewer with lurid suppositions and over the top melodrama. Javier Bolado's performance as Nico is the centerpiece. Nico is no angel, and yet, as the film grinds through its two-hour runtime, the audience can't help but to root for his strange protagonist. His chemistry with Miriam Martin's enigmatic Medea is purposefully strained and each actor does an amazing job exploring the horrific possibilities of the scenario. One of the most striking features is Yon Gijon's art direction. The interior world of Medea's putrid sanctum has a disquieting mystical feel that pervades every scene once the action moves inside. Cleverly placed occult items litter the cockroach kingdom, allowing the viewer to slowly decipher Medea's insidious plot. Adrian Hernandez's cinematography is filled with deep oranges and pastel blues, capturing the revolting subject matter with evocative wide shots of Nico as he enters the rabbit hole and desperate, intrusive close ups once the fluids begin to flow. And they do flow. Once the story enters the final act, Virgin removes any sense of restraint or grace and doubles down on stomach churning, sanity questioning visuals that remain in the subconscious like a bad dream. Fair warning, there are things in this film that cannot be unseen and this is part of Virgin's dirty toilet charm. San Sebastian’s direction is solid throughout, though some may feel the film runs for too long. However, some of the editing choices, particularly during the gruesome conclusion are amazing. There’s a scene in which Nico is in a bathroom and Medea is on the other side of the door that showcases San Sebastian’s horrific compositions, while simultaneously providing one of the film’s many laugh out loud moments. Coming soon to digital on demand, The Night of the Virgin is an outright insane experience. It's offensive, disgusting, and makes absolutely no apologies for it irreprehensible presentation. Filled with audacious sequences of sexual violence and the abrupt evacuation of every one of the four humours, this is the kind of film that was born for a midnight showing. However, if you're interested in something with any semblance of propriety, look elsewhere. Virgin knows there are limits and it obliterates them in a fashion that would make Herschell Gordon Lewis proud.